The EUR/USD rate is trading at 1.1362 at the start of the new trading week, after falling over 0.8% in the week before, due mainly to a strengthening U.S. Dollar on the back of the recovery in the U.S. stock market and healthier economic data. The technical picture is actually more bearish than it was at the start of the previous week. 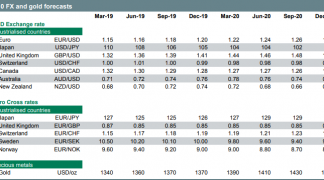 Despite temporarily piercing above the trendline drawn from off of the January 2018 highs, the exchange rate ultimately failed to break above it and declined in the week before. This decline is now so advanced it suggests the probable onset of a new short-term bearish trend. The pair has completed a series of peaks and troughs lower on the four-hour chart, which is usually taken as the first possible sign the short-term trend has reversed course. The next major support level is the trendline drawn from the January 3 lows at 1.1335. The pair is expected to fall to this and then probably consolidate or bounce temporarily. We would ideally wish to see a clear break below the trendline and the 200-week moving average (MA) situated at 1.1320, before forecasting a deeper penetration to evolve. This is because the 200-week could prove a major obstacle to the evolution of the downtrend so it needs to be cleared for the trend to continue. For confirmation of a breakout lower and the extension of the downtrend, we would ideally wish to see a clear break below the 1.1300 level, or even 1.1290 to be sure, before expecting a continuation down to a target at the 1.1200 level of the November 2018 lows. If it is destined to happen it should occur within the next 2 weeks. Momentum, as measured by the RSI indicator in the lower panel, is at about the level it was at in November when the pair was trading at 1.1300, suggesting a further downside bias and supporting our view the exchange rate could decline further. The main event for the Euro is the European Central Bank (ECB) rate meeting on Thursday at 12.30 GMT. Although no change in policy is expected at the meeting the markets will be watching what is written in the statement and what president Mario Draghi says in his press conference afterward. Investors will be especially keen to hear the ECB’s assessment of the Eurozone economy in the wake of the sharp slump in growth recorded in the second half of 2018. If the ECB's assessment is also more negative than expected, the Euro will probably weaken, if there is no change in the message, it will trade at the same level. “Draghi will probably be quizzed by reporters on what the central bank intends to do if the economic backdrop in the Eurozone continues to worsen. 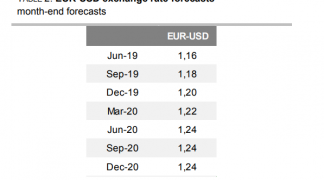 Any indication that the Governing Council discussed delaying a rate hike or even loosening policy could send the Euro tumbling against the greenback,” says Raffi Boyadjian, market analyst at broker XM.com. A glut of sentiment data dominates the economic calendar for the Euro in the coming week. The main release on the sentiment data front is Eurozone Manufacturing and Services PMIs for January out at 9.00 GMT on Thursday. 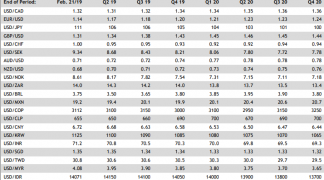 PMIs have been in decline since the start of 2018 and analysts will be keen to see if the trend has extended into 2019. An important watershed for the metric is 50. A result below that is indicative of decline; a result above is indicative of growth. The composite PMI, which is a broad gauge - a combination of the results for the two sector PMIs - is forecast to recover slightly in January to 51.4 from 51.2 in December. Such a recovery might help support the Euro because it might raise hopes the slow leeching lower in 2018 was coming to an end. The German ZEW survey of 350 financial professionals is published on Tuesday, at 10.00. In the previous month it recovered a touch after beating expectations of a -23 result by coming out at -21 instead, which, whilst still very pessimistic, was still nevertheless better. Markets will be watching whether the same can be said of January, and if it can, the Euro could gain some respite. The final sentiment release is the IFO sentiment survey of German business managers, out at 9.00 on Friday. 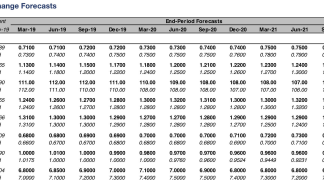 All these surveys are seen as fairly reliable forward gauges of future activity and are used by analysts to help provide a preview of harder data which is normally released latter and can affect markets more.